By and large, there's not a lot to like about Kansas City Chiefs head coach Todd Haley. He played golf, not football, in high school and college. His father was an NFL big shot. He's prone to tantrums. He rolled over some coordinators quickly. Whitlock hates him. 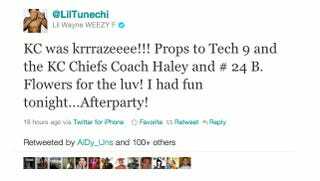 And so when Haley attends a Lil Wayne concert and reps Weezy—as he did last night and today—the whole thing looks silly and transparent. Q: How was the concert last night? HALEY: "It was good, very good. I see that's getting a little… Our players all knew I was out there. Lil' Wayne—our song last year-–we made a video at the start of the season and it was one of his songs. The players took to it. We played it every home game. It was kind of our… When you saw us gather up in the end zone, it was always a song of his. So, I said if he comes into town and I get an opportunity to give him a copy of it and thank him, I was able to do it. It was a great, great show, terrific." Q: Does that give you credibility in the locker room being a Lil' Wayne fan? HALEY: "I don't know. They didn't know it a whole bunch until... I guess now they know." Q: It's better than being a Barbara Streisand fan. HALEY: "I'm a fan of hers, too. Everlong? Evergreen. Everlong is the Foo Fighters. See, Foo Fighters, I like the Foo Fighters. I'm versatile. I like a broad range." Q: Who is your all-time favorite? HALEY: "Lil' Wayne is up there. I like him. He's good. He's good. He thinks outside the box for sure." It's that last question which establishes what a farce this is. Haley is a 44-year-old golfer who also admits to liking the Foo Fighters, and (really!) Barbara Streisand. He's like an awkward dad who needs this to connect with his kids, except he actually went through the trouble of attending the concert, which shows how deep he's in with his players. The reason to laugh at Haley is that he actually thinks this will help him coach his team, or that this makes him look hip, somehow. He's tried similarly goofy gestures before. But there's nothing wrong with a lil Wayne before the season, Florio.